John Marshall could hardly believe his eyes when this red jasper statuette was found by M.S. Vats at Harappa: ". . . it seemed so completely to upset all established ideas about early art. Modelling such as this was unknown to the ancient world up to the Hellenistic age of Greece, and I thought, therefore, that some mistake must surely have been made." As he gradually realizes that this must be older, he continues in 1931, "The statuette on  is of a fine red stone . . . now there was no stone obtainable at Harappa or anywhere near it. Whatever stone was needed there had to be brought from great distances. . . . There is another point of technique that is also significant. 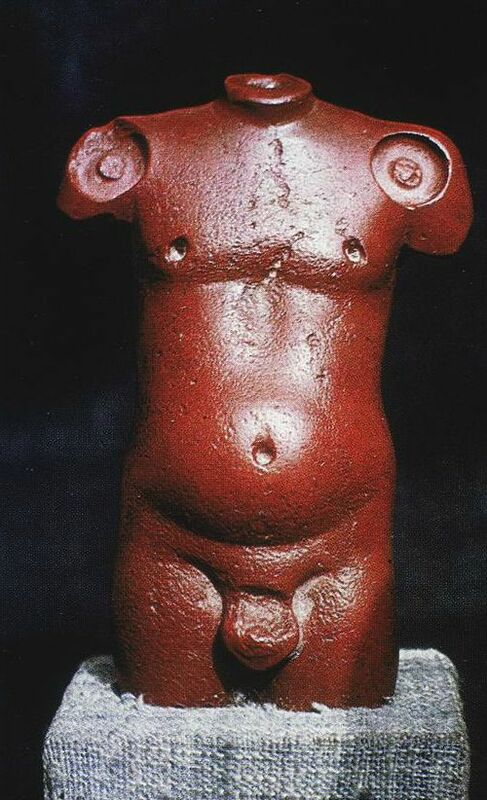 In the red stone statuette there is a large circular depression in front of each shoulder, with a smaller circular protuberance broken in the middle of it. What these depressions were for is not clear. They look as if they were to be inlaid with circular ornaments . . .. The treatment of the red stone torso could hardly be simpler or more direct. The pose is a frontal one with shoulders well back and abdomen slightly prominent; but the beauty of this little statuette is in the refined and wonderfully truthful modeling of the fleshy parts. . .. This is work of which a Greek of the fourth century B.C. might well have been proud. And yet the set of the figure, with its rather pronounced abdomen, is characteristically Indian, not Greek; and even if Greek influence could be proved, it would have to be admitted that the execution is Indian." (Marshall, Mohenjo-daro and the Indus Civilization, Vol. I, p. 46). What is puzzling about the ancient Indus civilization is that so few such statuettes have been found, yet they are of such exceptionally high quality. How was this possible?